Stanley Yelnats’s family has a history of bad luck, so he isn’t too surprised when a miscarriage of justice sends him to a boys’ juvenile detention center, Camp Green Lake. But there is no lake—it has been dry for over a hundred years—and it’s hardly a camp: as punishment, the boys must each dig a hole a day, five feet deep, five feet across, in the hard earth of the dried-up lake bed. The warden claims that this pointless labor builds character, but that’s a lie. Stanley must try to dig up the truth. 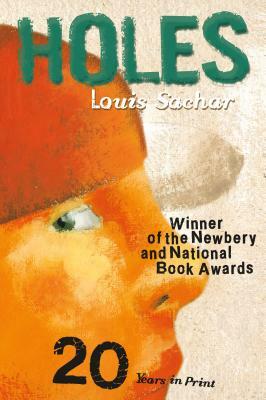 In this wonderfully inventive, compelling novel that is both serious and funny, Louis Sachar weaves a narrative puzzle that tangles and untangles, until it becomes clear that the hand of fate has been at work in the lives of the characters—and their forebears—for generations. It is a darkly humorous tale of crime, punishment, and redemption. I'm sitting in my office, which is located over the garage of my house in Austin, Texas. My dogs, Lucky and Tippy, are here with me. They are the only people allowed in my office when I'm writing. Lucky seems to understand that. He growls at my wife or my daughter if they try to enter. Maybe he hears me growling on the inside. Lucky doesn't realize I'm not working on a book right now. Instead, I'm having to write this biography for my publisher. I'm not sure what people want to know about me. I'm afraid that my life isn't as interesting as people imagine it to be. I write every morning. After about two hours, I can feel myself losing energy and concentration. It's best to quit when I'm still excited about what I'm writing. Then I'll be ready to go when I start the next day. I couldn't write for a longer amount of time, even if I wanted to. Tippy has gotten used to my schedule, and after two hours she taps me with her paw, howls, barks, and otherwise lets me know it's time for her walk. I never talk about a book until I'm finished writing it. (Lucky and Tippy are sworn to secrecy as well.) It took me a year and a half to write Holes, and nobody knew anything about it, not even my wife or my daughter. I think that is helpful for writing, as well as for anything else that takes a lot of self-motivation. The more you talk about something, the less you tend to do it. By not permitting myself to talk about Holes, I was forced to write it. The story was growing inside me for a year and a half, and I had no other way to let it out. I write five or six drafts of each of my books. With each draft, the story changes and the ideas are transformed. What amazes me is that most days feel useless. I don't seem to accomplish anything -- just a few pages, most of which don't seem very good. Yet, when I put all those wasted days together, I somehow end up with a book of which I'm very proud. Somehow I've now written eighteen books. In case you need this for a homework assignment, I'll include some facts about my life. I was born in East Meadow, New York, in 1954. My father's office was on the 78th floor of the Empire State Building, which I still think is pretty cool. When I was nine, we moved to Tustin, California. I went to college at the University of California at Berkeley and graduated in 1976, as an economics major. The year after I graduated from college, I wrote my first book, Sideways Stories from Wayside School. I was working at a sweater warehouse during the day and wrote at night. Almost a year later, I was fired from the job. I decided to go to law school. I attended Hastings College of the Law in San Francisco. My first book was published while I was in law school. I graduated in 1980. For the next eight years I worked part-time as a lawyer and continued to try to write children's books. Then my books started selling well enough so that I was able to quit practicing law. My wife's name is Carla. When I first met her, she was a counselor at an elementary school. She was the inspiration behind the counselor in There's a Boy in the Girls' Bathroom. We were married in 1985. Our daughter, Sherre, was born in 1987. She was four years old when I started writing the Marvin Redpost series. That's why Marvin has a four-year-old sister. In my spare time, I like to play bridge and tennis. I'm a much better bridge player than tennis player. The other evening, I played tennis with a teacher. She clobbered me. When I found out she was a fourth-grade teacher, I told her who I was. She was very impressed. She couldn't wait to tell her class she had killed Louis Sachar playing tennis! One thing I always want to know about my favorite authors is who their favorite authors are, so I will end with that. My list includes E. L. Doctorow, J. D. Salinger, Kurt Vonnegut, Kazuo Ishiguro, Flannery O'Connor, Rex Stout, Katherine Paterson, and E. B. White.